Overcast. A stray shower or thunderstorm is possible. Low near 50F. Winds WNW at 10 to 20 mph..
Overcast. A stray shower or thunderstorm is possible. Low near 50F. Winds WNW at 10 to 20 mph. Davenport works fill potholes in the 1400 block of Bridge St.
An Iowa State Patrol officer tags a picture of the VIN number on a car Friday before it is towed away at the intersection of Columbia Avenue and Brady Street in Davenport. A driver navigates flood waters from the Rock River in the 3800 block of 49th Ave. Thursday, Feb. 7, 2019, in Moline. A good Monday to all. 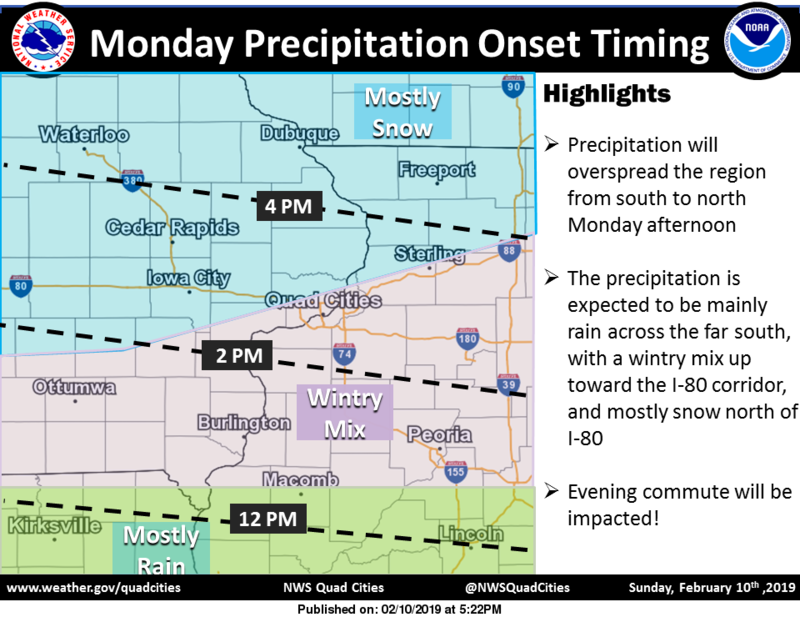 Another winter storm has the Quad-City region in its sights. Let's take a look at the latest National Weather Service forecast. The Nation Weather Service has issued a Winter Storm Warning for the region beginning at 3 p.m. today an continuing until 9 p.m. Tuesday. 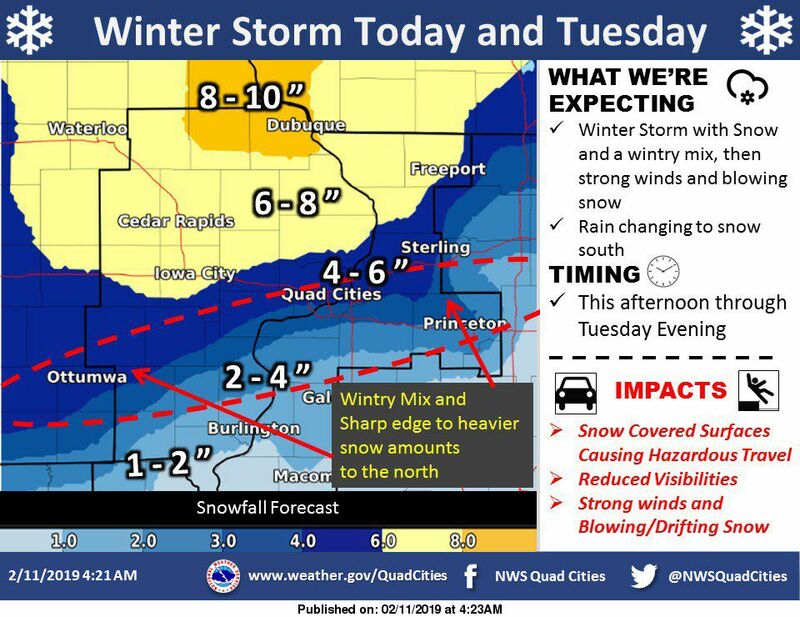 According to the storm warning, "An area of low pressure will strengthen as it tracks from Oklahoma to southeast Lower Michigan bringing widespread snow and mixed precipitation to eastern Iowa and northwest Illinois. The most likely area for a period of sleet and freezing rain is along and south of a Freeport, Ill. to Iowa City line. Moderate, to at times heavy, precipitation is expected to develop quickly during the mid to late afternoon today, and continue into tonight. Light to moderate snow will continue on Tuesday. By Tuesday afternoon strong northwest winds will develop with gusts up to 40 mph. This will cause considerable blowing and drifting into Tuesday night, especially where the heavier snow occurs." Drivers should plan on slippery road conditions. Patchy blowing snow could significantly reduce visibility. The hazardous conditions could impact Tuesday's morning and/or evening commute. Snow is likely after 3 p.m. Skies will be cloudy with a high near 33 degrees. East winds between 5 to 15 mph will gust as high as 20 mph. The chance of precipitation is 60 percent with total daytime snow accumulation of less than a half inch possible. Tonight rain and snow, possibly mixed with freezing rain, will become all snow after 3 a.m. The low will be around 30 degrees. East winds will gust as high as 25 mph. The chance of precipitation is 100 percent with new ice accumulation of less than a 0.1 of an inch possible. New snow accumulation of around 2 inches is expected. Tuesday: Snow is likely before noon with patchy blowing snow after noon. The high will be near 32 degrees. It will be breezy with a north wind 10 to 15 mph becoming west 20 to 25 mph in the afternoon. Winds could gust as high as 35 mph. The chance of precipitation is 90 percent with new snow accumulation of around an inch possible. Tuesday night: There will be a 20 percent chance of snow before 9 p.m. with patchy blowing snow before 2 a.m. Skies will be cloudy then gradually becoming partly cloudy with a low around 9 degrees. Wind-chill values will be as low as -5 degrees. West winds will gust as high as 35 mph. The Flood Warning continues for the Rock River at Moline continues until further notice. Early today the Rock was at 14.3 feet and holding steady. Flood stage is 12 feet. Major flooding is occurring and is expected to continue. The Rock is expected to fall 14.1 feet tonight then continue falling. At 14 feet, water affects South Shore Drive and North Shore Drive in Moline west of the 27th Street bridge. Water limits access to homes on South Shore Drive east of the I-74 bridge. Water also affects portions of 60th Street south of John Deere Road. In between the snow, sleet, rain, freezing rain and arctic temperatures, public works crews in Davenport have been filling the potholes the winter leaves behind. To report a pothole call, 563-326-7923 during between 7 a.m. to 4:30 p.m., Monday through Friday, or submit a request online at https://yourgov.cartegraph.com/. When submitting your request, state the size of the pothole to help crews prioritize. You can also include pictures if you have an opportunity to capture an image safely. Davenport has more than 1,100 lane miles of pavement. Kacey Musgraves won top album and matched Childish Gambino with four Grammys total. A year after many women felt left out of the Grammy telecast, they delivered the night's most memorable performances. The best new artist winner, British singer Dua Lipa, also cast major shade on the outgoing recording academy president. Read more. Warren discussed that, as well as health care, economic and agricultural issues in an interview with the Times Bureau ahead of her campaign event in Davenport, Sunday. She also held events Sunday in Cedar Rapids and Iowa City. Read more. Clinton Police, the Iowa State Patrol and the Davenport Police Department are involved in an investigation where a woman allegedly stole a vehicle in Clinton and then raced into Davenport causing three crashes Friday, police officials said. One of the crashes occurred at Brady and 65th streets. Five people from one vehicle were taken to Genesis Medical Center-East Rusholme Street, Davenport, with non-life-threatening injuries.